You and your baby are on the move, so you need an infant formula that can go anywhere with you. 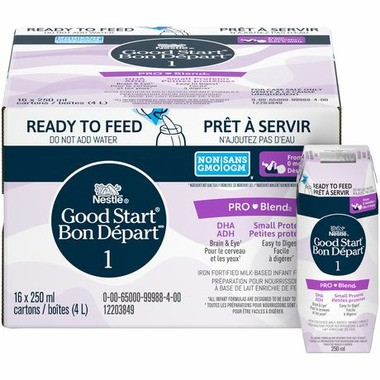 Ready to feed infant formula in Tetra Pak cartons are easy to open and easy to use for added mom convenience. Unlike many metal cans for concentrated liquid and Ready to Feed infant formula, Tetra Pak cartons are made without the use of BPA. Only Good Start is made with 100% whey partially hydrolyzed, which are small proteins for small tummies. Now with GOS: Oligosaccharides are naturally found in breastmilk. GOS is a form of oligosaccharide that Nestlé is now adding to Good Start Omega 3&6.